Thanks to the accelerated recruiting calendar, national signing day in February is likely to be a ho-hum affair. By rearranging the recruiting calendar, more schools are hosting official visits in the spring. National signing day is normally trumpeted all over the college landscape as a can’t-miss day of unbridled optimism. For college football coaches, it’s Christmas in February. For athletes, that long, grueling recruiting process that most come to loathe finally ends. Parents are just relieved that someone else will pay their child’s tuition. This Wednesday, Texas fans can mostly go about their normal day. Forget about fax machines and three-hat monte. No need to do anything until coach Tom Herman’s press conference at 2 p.m. Thanks to the accelerated recruiting calendar, national signing day in February is likely to become a ho-hum affair. If anything, it’s anti-climatic. Every member of the American-Statesman’s Fabulous 55 recruiting list either already signed a national letter of intent in December or is committed. In fact, 29 of the state’s top 30 recruits on that list have already signed. The Longhorns signed 22 athletes in December. Nine enrolled early. They added a 10th when five-star sensation Bru McCoy signed and then transferred from USC to Texas and started classes in Austin. McCoy’s eligibility for the fall is still undetermined. His decision to enter the NCAA transfer database just days into his first semester at USC is a high-profile case that will be watched nationally. To get a transfer waiver, McCoy could argue that once then-offensive coordinator Kliff Kingsbury left USC to become an NFL head coach, the athlete was misled during the recruiting process. One UT source said the university is purposely keeping quiet about McCoy so the NCAA won’t feel compelled to rule against the athlete. No final decision is expected any time soon. Meanwhile, another 13 future Longhorns, like the Gatorade national player of the year Jake Smith, are scheduled to arrive this summer. Otherwise, that’s it. Herman should finish with the nation’s third-best signing class — a ranking that was boosted six spots by McCoy’s addition — and most likely 24 new players total. So how did college football’s most exciting day become so dull? The NCAA changed its rules two years ago that created an early signing period in December. The theory was it was player-friendly as those who already made up their minds could sign and be done with it. Coaches liked it, too. It lowered their stress levels. In December 2017, Texas signed 19 players as part of the 2018 class. Then the Horns added eight more in February for a class that ranked third nationally behind only Georgia and Ohio State. 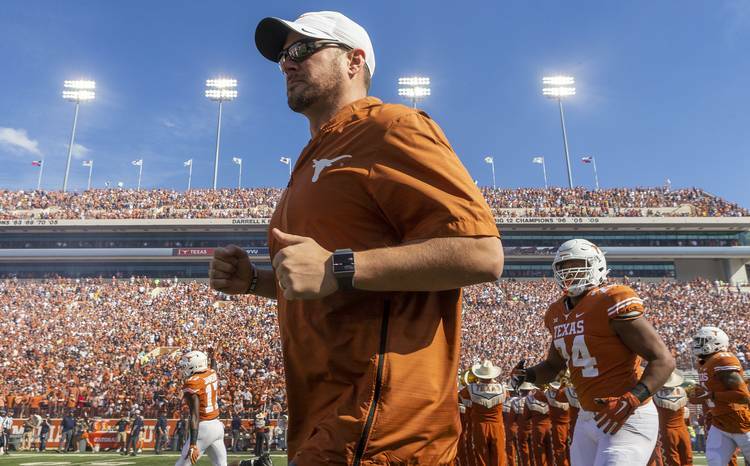 It was Texas’ highest-rated class since 2012, when the Longhorns’ class that was topped by Aledo running back Johnathan Gray and Brenham defensive tackle Malcom Brown ranked No. 2. Last December, Herman pushed to get everyone’s signature on a national letter of intent before Christmas. And he nearly did. “I think when the rule was passed, I don’t think anybody foresaw this large of a percentage of the elite players in the country signing now,” Herman said at his December signing day press conference. According to the NCAA, 90 percent of FBS-level recruits the first year signed in December 2017. By rearranging the recruiting calendar, more schools are hosting official visits in the spring. The Longhorns still put recruits up in the Four Seasons Hotel and treat them to dinner at the Vince Young Steakhouse. They’re just not doing it in the fall. Howe said high school athletes know more about the rules and take advantage of so-called “unofficial” recruiting visits. On unofficial visits, recruits pay their own travel and meal expenses. They simply don’t get the red carpet treatment that recruits on official visits might receive. By rule, high school athletes are allowed five official visits during the recruiting process. Herman, Texas A&M’s Jimbo Fisher and Oklahoma’s Lincoln Riley are well into their 2020 recruiting process. Wednesday’s press conferences around the country will be mostly for the fans. “The quicker you can start devoting time, energy and resources to the next class, to not fall behind your competition, the better off you’re going to be,” Howe said. Forget about Wednesday. Come December, fans will learn their answer.